Many destinations, eg. Museum Village, Wildlife Park, Old Country, Opera, Theater and Musical. Property 54: Many destinations, eg. Museum Village, Wildlife Park, Old Country, Opera, Theater and Musical. Property 64: New dream apartment up to 6 persons ★ Schanzenviertel ★ "BARKASSE"
Property 86: The apartment Luca is designed for a comfortable stay of up to 4 people and also equipped with free Wi-Fi. Property 90: EXKLUSIVE Ferienwohnung im Hamburger Westen für 6 Personen! Comfortable shotgun with handy location! The Kleines L&ouml;wenhaus apartment/flat/wohnung provided comfortable accommodations for us for twelve days/nights this past March. The photos on VRBO accurately reflect the layout and amenities. The beds are comfortable, the kitchen is tight but perfectly workable and the window at the front of the living/dining room provides wonderful light while breakfasting or just sitting to read and write. Once Malcolm adjusted the WiFi, it worked perfectly for us. The neighborhood is quiet but full of interesting shops and restaurants...including a vegetarian restaurant that has delicious items on its Tagesmenu. We appreciated the easy access to the U-3 line which will take guests to the main parts of Hamburg in just a few minutes. The four block (or so) walk from the station to the Kleines L&ouml;wenhaus was not a problem for us...even on our arrival in some rain. The neighborhood is fairly typical of residential Hamburg, we imagine, and far less trendy (and hectic) than areas near Altona or the tourist areas near St. Pauli. The landlords (Andrea and Malcolm) are attentive and easy to reach. Our flight into Hamburg from Amsterdam was cancelled, so we arrived much later by train. Malcolm waited until we arrived, much to our relief. 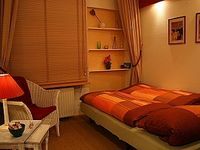 I'm not sure if VRBO allows the exchange of contact info early in the process, or perhaps I simply missed it, but if you are an English speaker, being able to connect early with Malcolm would allow for a smoother path to the Kleines L&ouml;wenhaus. 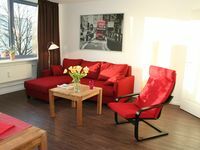 We enjoyed our stay and recommend Kleines L&ouml;wenhaus to visitors to Hamburg.